The stretch tank top for men Allows for a completely uninhibited range of motion. 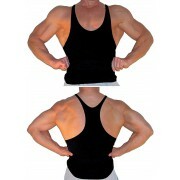 The human Y-back or the ribbed tank top manufactures Enhances the look of a bodybuilder physique. You can get a stretch tank top in each style in this workout clothes store. 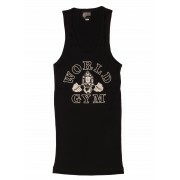 This ribbed wife beater tank top is made from a special 100% ringspun cotton featuring the World Gym gorilla screen-print. A ribbed wife beater has a form-fit making it a great muscle tank top. Available in four colors. Like all workout clothing this mens ribbed tank top ships to destinations around the globe the same business day. ..